Your blue teacup is very vibrant indeed and very ornate with all the gold trim on it. Quite lovely! I love the aqua colour of the two glass teacups. They do look like depression glass but someone else would know for certain. I always enjoy coming to visit you. You make your post so interesting with all the history of the teacups. Have a lovely week. All my best for a wonderful week! My, your blue teacup is so stunning. I luv this kind of pattern but as now I dont have one. Thanks for sharing. Hi Terri....Woweee...I adore this tea set...super super gorgeous...I love the color so much and it is truly just so lovely! thanks for sharing this beauty!! And thank for your lovely visits! Hugs! they mean alot! Hope things get better with the computer glitches!! First the blue tea cup set if absolutely gorgeous!! Then it seems each one you share has feminine uniqueness which I love! Second, as I was attempting to send you this message, I received a message through Blogger, three times saying "Service Unavailable 503"--I have been receiving this since Saturday; I have no idea why or how to report it. What an exquisite teacup, Terri. The blue is a stunningly beautiful shade!! And the rose is gorgeous!! How neat that it is signed by the artist. I don't know that I've ever seen a signed teacup...I certainly know I don't have one like that. 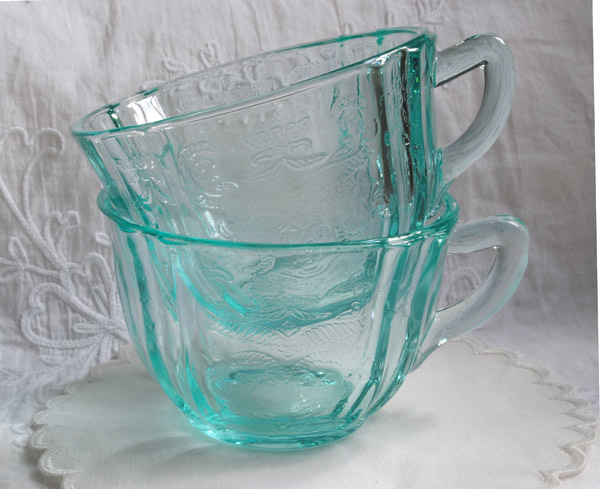 I love Depression glass, and I think your two teacups are lovely. How amazing that you snagged them for $1 each. That's a steal, girl!! Finally, not sure if this is what you are talking about, but there are many blogs I am unable to access. I get a strange "operation aborted" message pop up and then it takes me to a "service unavailable" page. I don't know what causes this, because it happens to blogs I've formerly been able to access. Terri, I love the way the gold pops off the vibrant blue. And the roses are just gorgeous!!! Your blue glass cups are so pretty too!! Great find! 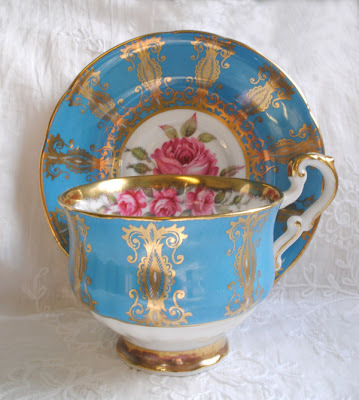 Hi Terri, I love your turquoise tea cup! It is so brilliant. Simply stunning. I enjoyed the history you shared too and the blue thrift store cups are a pretty find. You really do have some lovely cups, Terri! Hi Terri! Gorgeous teacup. Love the flowers and colors! And yes, I've been getting that same very annoying error message for DAYS! It is so exasperating when trying to leave a comment! I've begun to copy and paste my comment, just in case Blogger loses it! I think the beautiful clear cups are Depression glass, too, but I'm not an expert! I hope to join in on Tea Cup Tuesday, if I can get my act together this evening!! Oh, that teacup and saucer is gogeous! The color is amazing!! I have never seen a signed tecup. now you are going to have me looking for them! oops , got so excited to be part of this, forgot to say how much i LoVe your glass cups! WoW! that's a deliteful find.. thx for sharing! i have a matching cup to yours in a deep rose colour - gift for being my best friend's bridesmaid! and she's doing my b'day lunch on tuesday! Thanks so much Terri! Just lovely, as usual! Blue and pink, what could be better? Bonjour Terri - Yeay, it's Tuesday! I really love the intensity of that blue teacup and saucer. And having it signed is so special. But I really love the most are the two aqua glass teacups. I'm sure you were surprised to find that they only cost $1 buck each. What a great find! I just love your blue tea cup. It's really beautiful. I like the glass tea cups, too. So pretty. As for Blogger - it's been giving me a little trouble, too. It seems buggy here lately. Sandi, what lovely teacups! I think your blue and gold is a great example, and love those colors! I'll keep an eye out for your saucers too in my area! Who knows, perhaps I'll find some! That sure is one gorgeous blue and roses teacup! It certainly is Queen worthy! I've never seen a signature on a teacup before and what a special treasure you found! The glass cups sure look like depression glass to me and do I see little bubbles in them? Not sure but that would make them even older wouldnt it? The shade of blue is amazing and reminds me of beach glass. I sure enjoyed my visit today! P.S. I havent had any blogger troubles today but having said that I will now I bet HA! Hi, I am joining your Teacup Tuesday for the first time. I love your blog and your teacups are so pretty. The color of those glass teacups is absolutely dreamy!!! Aloha Terri; Your teacup is absolutely beautiful! How wonderful to have a signed piece. What great luck to have found such gorgeous glass cups. Have a great week. Hi! I love all your beautiful teacups, and the information too!! I use to have the same depression look set on the bottom. They were reproductions, lovely none the less! Paragon is definitely the favorite teacup of the day - I have seen 2 other posts of these exquisite cups. I think your glass cups are from the depression era - I have pink ones - I have never seen them in that beautiful blue - what a treasure you have found! 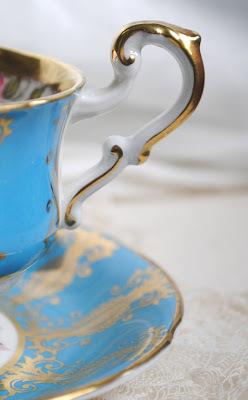 I love the blue teacup you have pictured! I look for blue teacups at antique stores around here and am usually told they are sold out of them. 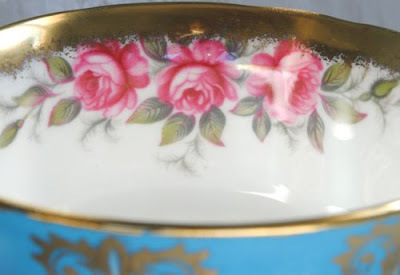 I like your Depression cups very much and hope to read more about them, maybe someone will offer you saucers for them. Thank-you again Terri for hosting this fun Teacup Tuesday with Martha, I am learning so much and having a blast! dear Terri, I am speechless looking at your teacup! this is my fave teacup for today! love the blue & roses on it.. and more precious when it has signature on it.. thanks for sharing. Yes, your first cup is very unique. The shade is unusal too. Roses...so sweet. Wish I knew more about Depression glass but I don't. Yes, I have been getting that message off and on for a few weeks. It is extremely frustrating, isn't it? Especially when you've typed out a comment and it doesn't go through! I assume Blogger is having some glitches. This is one of my favorite colours. It is a vibrant blue! I was unaware that artists would sign their work. (Though they should, such works of art)I will be turning my teacups upside down to see what I might find. Thank you for hosting another wonderful teaparty. Hello, I've the same problem on blogspot at the moment, there are days it is so difficult to leave a post! What a wonderful way to share your love of pretty china with so many friends around the world! I enjoyed reading how you got your beautiful teacups, and perhaps another Tuesday I will join in and show you a favourite of my own. Your signed teacup is gorgeous. I really love that blue color and all the gold design. Your glass teacups are also very pretty. I have also had trouble lately with blogger "service unavailable" issues, difficulty leaving comments and slow blog loading. I wonder what's up with that? PS--I forgot--I am not having any issues w/Blogger at the moment--don't know what might be wrong with your situation, but you probably have already looked this up on the help page--wish I had more info for you! Terri, how marvelous to have a signed piece made by Doulton. That's fabulous. I too am having problems making comments on others blogs and I have heard people are having the same problem commenting on mine. Blogger can be frustrating sometimes. I had a difficult time posting pictures today, when in the past it's been easy. Go figure. I too have been having the same problem with blogger. I thought it was my computer. I love the 2 tea cups you have shared with us today!! I adore the colors. The second one is depression glass but I do not know what specific pattern it is but it is beautiful!! Your cups are always very special...This one is Great! 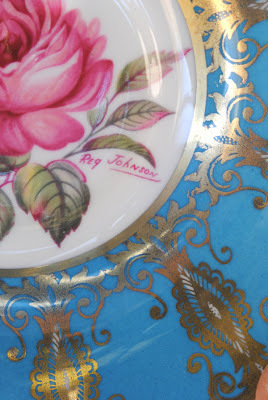 Hi Terri, a lovely set indeed- I like this particular shade of blue offset by the roses and gilding. I have a few examples of Paragon. The Paragon China Company was a British manufacturer of bone china from 1919 to 1960, based in Longton, Stoke-on-Trent, previously known as the Star China Company, and more recently part of the Royal Doulton group. 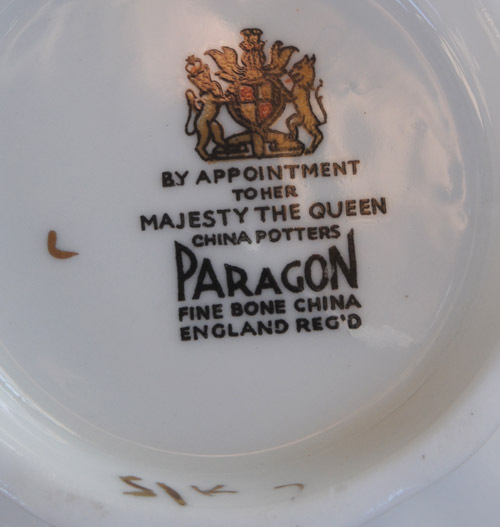 Paragon was noted for producing high quality teaware and tableware, and was granted royal warrants by several members of the British Royal Family. Just when I think you cannot possibly impress me more than you already have you bring out this stunner. Oh I just absolutely love those teacups!!!!!!!!!! This tea cup is enchanting. Love the vibrant blue with the pink roses. Great color combo! Hello Terri...its good to catch up and see your uplifting blog posts. I hope you have a great time in London. Unfortunately the show is only from 7th - 10th October. What a shame!